You can cancel the reservation for this tour for free right up to 48 hours before the start date; we cannot refund you (100% penalty fee) if you cancel after the deadline or if you do not show up. The departure time is 7:30 am. The pickup service starts at 6:30 am (service available only on hotels in central Rome listed in the dropdown menu in the reservation process). If your hotel is not reached, please meet the group at the Gray Line-I Love Rome office in via Vittorio Emanuele Orlando 95, opposite the Grand Hotel (Metro A Line, Repubblica stop) no later than 7:00 am. Late arrivals will not be accommodated. This guided tour is available in English, Spanish, German (French from April to October). The activity ends in Roma Termini Train Station. Enjoy a one-day round-trip excursion from Rome to the so-called Cradle of the Renaissance: Florence. The high-speed train you will catch from the Capital will grant you a fast and relaxing journey. You will not even realize having traveled from region to region. Touched by the Arno and small like a gem set in the heart of the Italian peninsula, Florence is romantic, charismatic and full of history. The city's urban fabric has changed very little since the Renaissance. Its streets and alleys tell a thousand stories, some true, some legendary. Food and wine are absolutely to indulge in too during a stay here because they are of word-class quality. From the wineyards and the wine-rich hills surrounding Florence come some of the most famous and appreciable wines on the Globe. 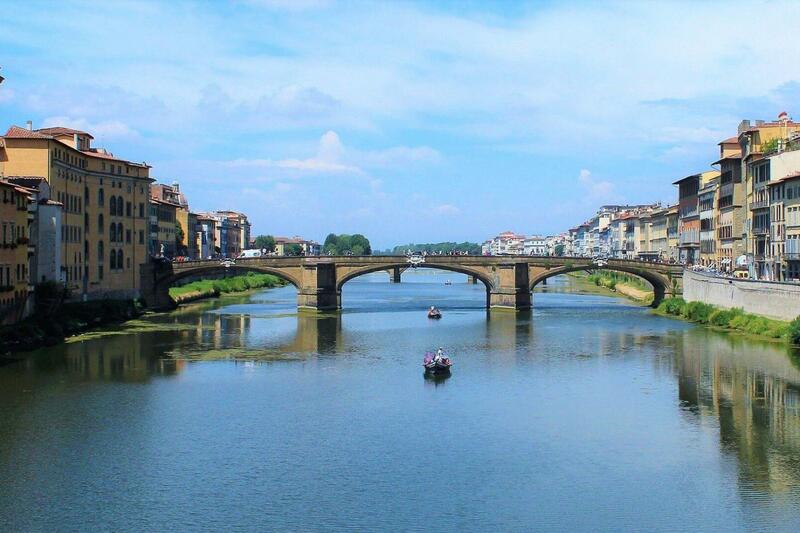 Florence is also known worldwide for its architecture and art. Despite its modest size there are plenty of sights of interest and things to do. Galleria degli Uffizi is home to the world's most complete collection of Renaissance art. Palazzo Vecchio is a fortress palace now seat of the mayor's office. Palazzo Pitti was designed by Brunelleschi, bought by the Medici and then donated to the State by the Savoys. Todays it hosts very interesting museums. The most iconic monument is without a doubt the Duomo characterized by neo-Gothic facade and a cupola that uniquely stands out in the cityscape. The Galleria dell'Accademia houses Michelangelo's David and therefore is really worth visiting. Corridoio Vasariano is a 1 km long arched passageway that connects Palazzo Vecchio with Uffizi and Palazzo Pitti. The walking tour included in this guided activity is organized so that you will be sure to cover the highlights of the city during a relaxing yet comprehensive visit led by a qualified guide. It will start from the breathtaking Duomo and will take you to the magic Ponte Vecchio going past via dei Cerretani, Piazza della Repubblica and Piazza della Signoria. By 11:15 you will access the Uffizi Gallery. After two hours spent unveiling the museum's beauties, some time will be dedicated to admire Piazza della Signoria; thereafter, you will head to a typical local restaurant for a well-deserved delicious lunch included in the rate. Before meeting your guide again at Santa Maria Novella Station by 6:30 pm to catch the train that will take you back to Rome, you will have the whole afternoon to continue the visit on your own or conveniently go shopping for souvenirs.